Our two guest-rooms, located on the 2nd floor of our house, have been recently renovated and redecorated offering all facilities in a charming atmosphere. A pretty old wood staircase will give you access to the rooms. It is requested to leave your shoes at the bottom of the stairs, Crocs will be provided. Each bedroom disposes of a double bed, furnitures, a small table-desk and a full equipped bathroom. An Internet connection (Wifi) is also available. There is no television in the bedrooms. 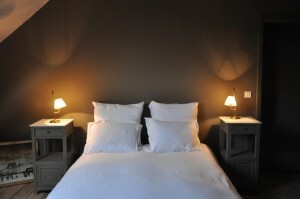 The Coté-rue bedroom is decorated with antiqued furnitures and paintings giving a romantic environment. Situated under the rooftop, the room is very large. The bathroom includes a sink, a bath, a separated shower and toilets. Note : the Coté-rue bedroom is very quiet due to the pretty low car circulation in our street. The Coté-jardin bedroom shows a more modern environment with a large dressing and a pretty shower-room decorated with Metro tiling. If the room is smaller, she is the one providing the best view from our house on the old rooftops of Mons and on the famous belfry. The rooms are strictly non-smoking. Pets are not admitted. It is required to inform us of your expected arrival time and to free up the rooms for 11 o’clock in the morning. Please have a look on our proposed prices . 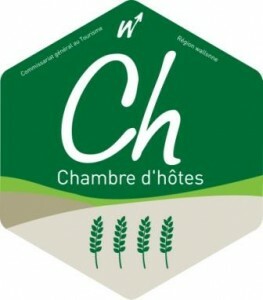 Our bed & breakfast is registred, with a rating of “4 Epis” synonymous of quality, by the Commissariat Général au Tourisme de la Région Wallonne.